Norman Mailer called writing “the spooky art,” partly because he never really knew where his ideas and words were going to come from next. But he trusted the blank page and the process. In decades past, sales management was much like this. It was part logic and skill, part crapshoot. Salespeople knew that a part of their efforts were wasted, but they didn’t really know what part. Thankfully, with today’s analytics and more effective methodologies, we’re able to shine a light on each stage of the sales cycle. Sales is still a little bit “spooky,” though. We’ve done our best to demystify it. And yet while we’ve written about measuring sales skills, building sales funnels, mistakes to avoid, and prioritizing activities, to name just a few topics, our primary business isn’t knowledge sharing. As sales CRM gurus, of course we’re endlessly fascinated with knowledge, but our m.o. is more about enabling it than imparting it. Thankfully, there are many talented professionals writing extensively about topics near and dear to our hearts, our clients, and our mutual bottom lines. If B2B is your sales thing, then you can always brush up on how best to sell to CEOs, CFOs, CTOs, and other C-level executives. In this book, authors Nicholas Read and Stephen Bistritz differentiate themselves by focusing on the executive’s perspective. This book doesn’t just depend on anecdotes. It’s based on extensive research projects in which the authors asked C-level executives about their relationships with salespeople. Teaming up with Hewlett-Packard in North America and China, Target Marketing Systems, and business schools from the University of North Carolina and Georgia State University, the authors surveyed leaders in more than 500 companies and government bodies. One insight their research uncovered was that corporate leaders aren’t adverse to sales pitches — as long as the salesperson approaches them the right way. And therein lies the rub. What is the right way? You’ll have to read the book to find out ... Mind you, if you’re unsure whether a book with such a laser focus as this is your cup of sales tea, consider first reading articles about selling to the C-suite on Forbes and Inc. Sometimes it’s hard to check if a writer has the experience, let alone the chops, to back up their work. They might be just a flash in the sales pan. With this book, though, you’re in good hands. As a founding member of the International Coach Federation, author Keith Rosen helped design a program to certify coaches worldwide. So he knows more than a thing or two about coaching. Still, to test whether this book is up your alley, consider watching some of this webinar by Rosen and clicking around KeithRosen.com. This book eschews the standard nonfiction approach. Instead, it’s more like Back to the Future wherein a fictional character jumps 10 years ahead and meets a version of himself. The trick is, the future self in this book will only come into existence if his past self overcomes his fear of failure and his self-limiting beliefs. And that’s when the dispensing of knowledge begins. Before committing to this book and learning how to turn the pain of failing into pleasure, consider visiting GoForNo.com. Also consider watching a video of Waltz and Fenton discussing the book. 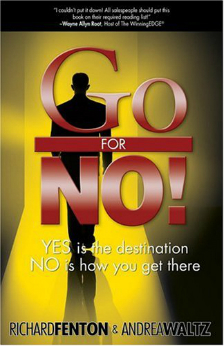 And don’t be deterred by the quirky title; the subtitle is as optimistic as they come: Yes is the Destination, No is How You Get There. 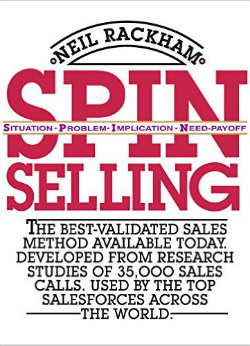 Another book heavily steeped in research, as opposed to one filled to the brim with anecdotes, is SPIN Selling. Indeed, if you’re less of a trust-your-gut sort of person and more of a trust-the-numbers kind of person, this book’s for you. 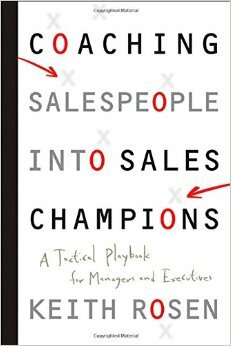 To write this book, Neil Rackham and his team studied more than 35,000 sales calls made by 10,000 salespeople in 23 countries. So what is the SPIN strategy to outsell your competition? The acronym relates to four kinds of sales questions that can motivate a sales prospect to buy. Situation questions are about facts and background. Problem questions investigate difficulties that the product or service can resolve. Implication questions explore the wider effects of the client’s problems. Need-payoff questions encourage the client to view the product or service as a solution to their problems. This best-seller also comes with a companion book: The SPIN Selling Fieldbook: Practical Tools, Methods, Exercises, and Resources. While SPIN selling focuses on questions, SNAP selling is about principles. Simple — making things easy and clear for your prospects and customers and helping them with complex decisions. iNvaluable — being someone your customers can’t live without. Aligned — connecting what you do with what your prospects want to achieve. Prioritized — focusing prospects whose urgent issues and priorities you can address. 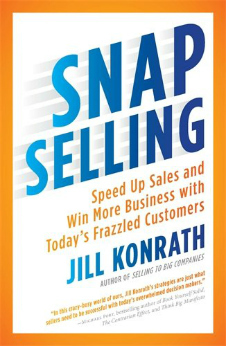 Also consider two other books by Konrath that appear on many top lists of great sales books, Selling to Big Companies and Agile Selling, and checking out JillKonrath.com. When the Star Wars prequel trilogy came out over a decade ago, the titles were important enough to have two colons each, such as, Star Wars: Episode II: Attack of the Clones. 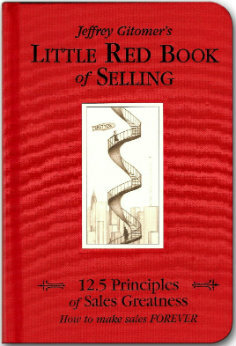 In sales, this book by Jeffrey Gitomer might be one of the few important enough books to warrant two colons, the full title being: Little Red Book of Selling: 12.5 Principles of Sales Greatness: How to Make Sales Forever. If you can make them laugh, you can make them buy. 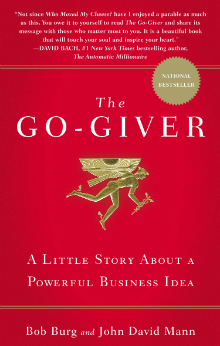 Not only does this book often appear on several lists of the best sales books, it also appears on lists of books that every entrepreneur should read (example: Forbes). If it tickles your sales fancy, be sure to also check out Gitomer.com and another one of his books, Little Red Book of Sales Answers: 99.5 Real World Answers That Make Sense, Make Sales, and Make Money. This book joins an illustrious yet short line of business fable books, including The One Minute Manager from the 1980s and Who Moved My Cheese? from the 1990s. However, what sets this apart from others in the so-called management fiction genre is how highly readers rate it. 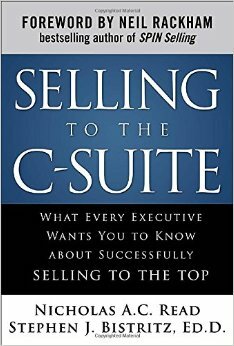 If you sort Amazon’s “Sales and Selling” section by average customer review, this book by Bob Burg and John David Mann will pop up at the top. Why? It’s not just because nearly 800 people have rated it five stars, but more so that 90% of customer ratings are five stars. The law of value — your worth relates to what you give exceeding what you’re paid. The law of compensation — your income relates to how many people you serve and how well you serve them. The law of influence — your influence relates to placing other people's interests before yours. The law of authenticity — your most valuable gift is yourself. The law of receptivity — your ability to be open to receiving relates to how effective you can give. 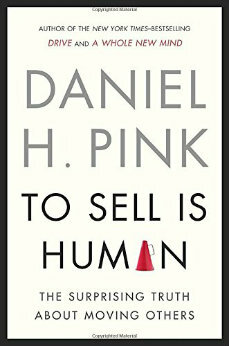 If you think society is buckling under the weight of materialism and selfishness, this book, which presents a healthy alternative to the sometimes dog-eat-dog world of sales, is for you. Also, consider clicking around TheGoGiverWay.com. If you have a Type A personality and derive more pleasure in confrontations than collaborations, this book might be just what you’re looking for. 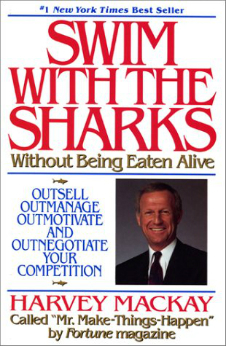 Harvey Mackay divides the book into three sections: salesmanship, negotiation and management. You’ll learn simple yet essential sales lessons, such as how it doesn’t matter how much something’s worth, it’s how much people think it’s worth. In our interview with the workplace guru and author, he said: “A lot of us don’t think of ourselves as salespeople, and I think that’s a mistake because we are selling it all the time.” He’s spot on. We move our friends and family to do things we want, just like how we might win over customers to buy something. He also made some poignant points about serving customers first and selling to them second, and how commissions can sometimes lead to salespeople gaming the system. What books about sales and selling are on your shelf or device? Whatever your answers are, you’ve probably read many of them, but not all of them. Truthfully, who has read all of Brian Tracy’s amazing books? Or all of Jeffrey Gitomer’s awesome books? There are so many books out there, it’s just hard to separate what’s useful or valuable from what is, ultimately, worthless. Reading is precious. That much we know for certain. And deep down, most of us agree that we should do it more. As the saying goes, reading is to the mind what exercise is to the body. 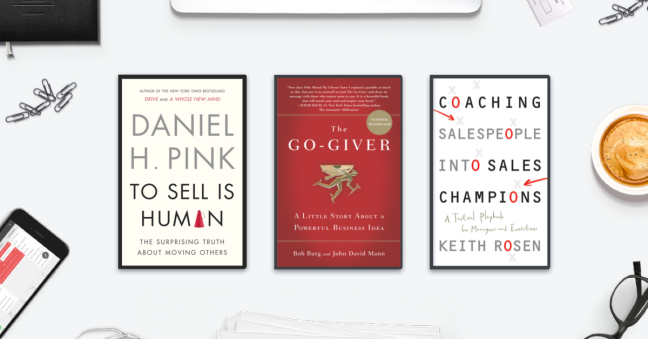 Let us know if any of these books rock your sales world. And if you don't want to read these books, why not have a read of our Global Sales Performance Review of 2017? Here you can learn how various countries sales performance compares to yours.